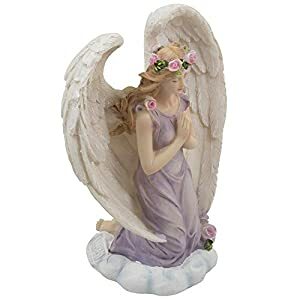 An angel kneeling in prayer atop a heavenly cloud inspires thoughts of the delicate beauty of roses in bloom, with her velvet robe and a crown of blossoms in her golden hair. – See full description below. Dimensions: 5 3/4″ x 3 5/8″ x 7 1/4″ high. Weight: 1.1 lbs. 325 queries in 0.855 seconds.